Prof Dr. A. J. Martin, PhD, MSc, PGCE BSc (Hons) | NZACE | New Zealand Association for Cooperative Education Inc.
Andy was the former vice-chair of NZACE from 2010-2016. He was the organiser of NZACE conferences held at Massey University in Wellington, 2015, and Palmerston North, 2010. He has worked on a national team of researchers undertaking a Teaching Learning Research Initiative (TLRI) funded project and has published a number of articles and resources on Work-Integrated-Learning (WIL) as a result of Ako Aotearoa grants. 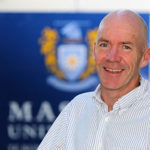 At Massey University, Andy has coordinated their work-based experiential learning practicum program in Sport Management for the past two decades. He was awarded an Academic Fellowship in 2012, to lead the development of the University’s Applied Learning strategy. He has also been recognised with university awards for distinction in both research and teaching. Andy is co-author of ‘Legends in Black’ (2014), a best-selling text on why the All Blacks win. He holds a PhD in management, which focused on the experiential process of Outward Bound. His undergraduate and master’s degrees were earned in England at Loughborough University (MSc. in Recreation Management) and Bristol University (BSc. Hons. in Mathematics and Computers Science).